Two people have been handed lengthy prison terms in Georgia for their part in disrupting the birthday party of an 8-year-old African-American with a provocative display of Confederate flags, racial slurs and armed threats in 2015. “If you drive around town with a Confederate flag, yelling the ‘N’ word, you know how it’s going to be interpreted,” Superior Court Judge William McClain said on Monday, said, according to WAGA. “Their actions were motivated by racial hatred,” McClain said, sentencing Jose Torres to and Kayla Rae Norton for their part in the incident in 2015, according to the Atlanta Journal Constitution. Torres received 20 years, with 13 to serve in prison, while Norton got 15 years, with six to serve. In addition, upon their release, the judge ordered them to be permanently banished from Douglas County. They were convicted of violating Georgia's street-gang terrorism law earlier in February. The pair wept openly in court. Torres and Norton were members of Respect the Flag, a group that had been demonstrating in defense of the Confederate battle flag. 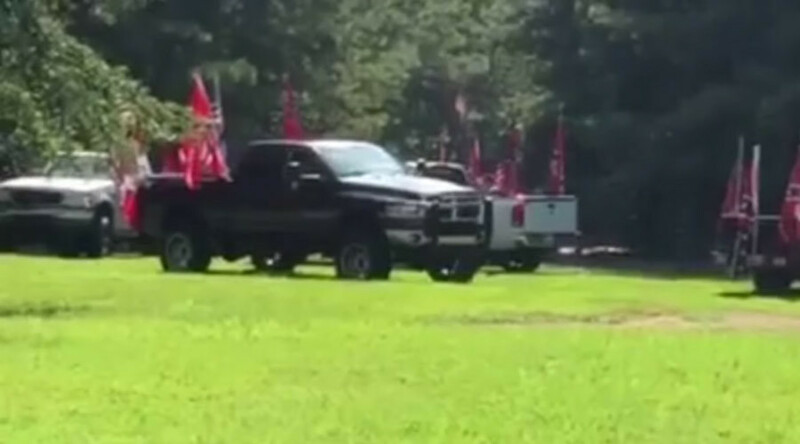 In a drunken, two-county rampage in pick-up trucks laden with Confederate battle flags, the group drove through Paulding and Douglas counties over July 24 and July 25, 2015, according to the AJC. During the frenzy, the Georgia group threatened African-American motorists, yelled at them and walked up to one of their cars with a gun. They also threatened African-American shoppers at a Paulding County Walmart and at a convenience store. The final stage of the episode was captured on two cellphone videos filmed by party goers when the group parked opposite an African-American 8-year-old's party. Clips show a Douglasville police officer holding off a group of agitated black men and women as at least seven trucks brandishing various flags drive by. Several other group members were also indicted by a grand jury for their actions that day, including Thomas Charles Summers and Lacey Paul Henderson II, who pleaded guilty to terror threats and battery charges. Summers was sentenced to four years in prison and Henderson to two, according to Patch. Douglas County Alabama. The Judge deemed this a hate crime then handed out stiff prison sentences. The incident occurred just over a week after white supremacist Dylann Roof shot and killed nine black people at a Bible study meeting in South Carolina. The Confederate flag is considered a racist symbol by many in the United States. During the 1861-65 Civil War, it was the flag of the Confederacy, a group of slave-owning states that seceded from the Union. After the Confederacy was defeated, the flag was adopted by many Southern groups, including white supremacists. Some people, however, consider the flag a symbol of their Southern heritage and reject the idea that it is racist.